It is not known where Jaume Huguet trained but it is thought that he spent time in Zaragoza before moving to Tarragona, then settling permanently Barcelona in 1448. After the death of the painter Bernat Martorell in 1452, Huguet became the pre-eminent painter in Barcelona and executed commissions for leading civil and military figures such as Don Pedro, Constable of Portugal. Huguet ran a prolific workshop with skilled apprentices and assistants, meeting the elevated demand for works by his hand. Huguet’s early period is marked by an interest in aerial perspective that he later abandoned. His work reveals a combination of influences, combining earlier Catalan Gothic strains and others of Flemish origin. His first documented work is the altarpiece for the high altar of San Antonio Abad (now lost). It includes characteristics of his most distinctive style including the monumental frontality of the enthroned saints and the use of gold backgrounds. Other works from this phase include the main altarpiece for the church of San Vicente in Sarrià and the Archangel Michael Altarpiece (both Museu Nacional d’Art de Catalunya, Barcelona). 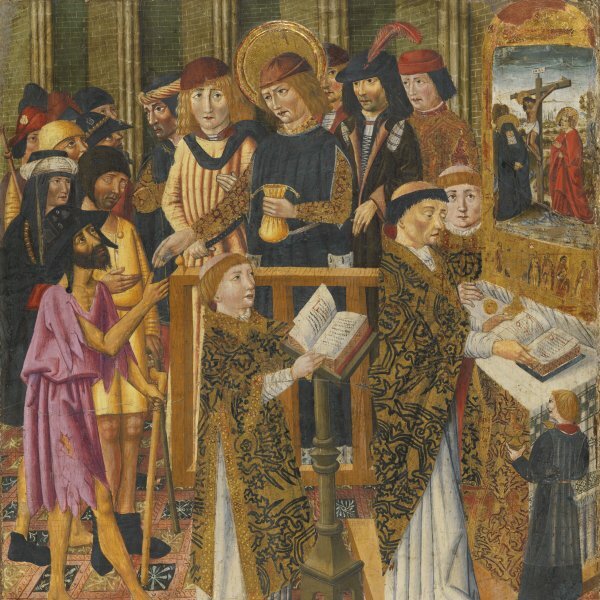 Huguet’s masterpieceis the Saint Augustine Altarpiece (also Barcelona), notable for the perfect symmetry of the figures within the pictorial space. Among the artist’s assistants and collaborators were Rafael Vergós and Pere Alemany, who continued his style into the early years of the 16th century. Huguet died in Barcelona before 4 May 1492.